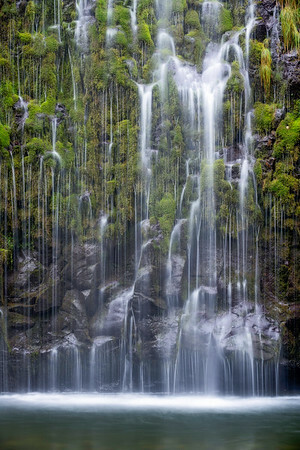 Hidden in the small Northern California Town of Dunsmuir, Mossbrae Falls is a waterfall flowing into the Sacramento River. Approximately 50 feet (15 m) in height and 175 feet (53 m) wide, the falls are fed by underground springs, which course down the canyon wall, creating the effect of many waterfall streams falling into the river. The falls are located just south of the lower portion of Shasta Springs. Access to the falls via a mile-long hiking trail on the Union Pacific Railroad tracks is currently closed, as Union Pacific and the City of Dunsmuir figure out a safer route to the falls.